Infinity War is the next big Infinity event by Jim Starlin and it came out just one year after the Infinity Gauntlet. Since that story is such a classic it created some big expectations for it’s sequels and I’m sad to say that this one just didn’t live up to them. I’ll get more into specifics later but right here I think a lot of Starlin’s later flaws become more apparent. Unlike last time where I only talked about the main event, I’ll be mentioning Warlock and the Infinity Watch #7-10 and Marvel Comics Presents #108-111 as they are important tie-ins. As mentioned last time, Warlock had the Infinity Gauntlet for a brief time and it was taken away from him by the Living Tribunal. We learn here that before he gave up his power, Adam expelled all the good and evil in his body to become a more logical being. After Thanos discovers a vast source of Cosmic Cube energy he locates the source to Warlock’s evil half, the Magus. With a new haircut and more power he has Eternity in stasis and is sending out evil doppelgangers of Earth’s heroes. After this we have three main groups going after the Magus now and that’s the basic plot as Magus just wants to make some duplicate Earth overtake the original. So the first problem I have here is with the villain. Here the Magus is just a generic doomsday villain who wants to destroy the Earth because he’s evil. There’s never anything more than that and it makes the main conflict so boring and predictable. Secondly, the heroes of Earth are way too incompetent here and have no effect on the greater story. The villains actually do more to stop the Magus than the heroes do because they’re too busy fighting each other. Speaking of villains, Doom and Kang are in this and they team up to fight Magus. Both being arrogant and egotistical villains they secretly hate each other and almost every scene with them has them with thought bubbles about how they’re going to betray the other. This goes throughout the story and it’s just an annoyance as it could have just been mentioned once or just inferred it’s going to happen with these two at some point. Instead we get this constant reminder and it’s not even funny in that classic Doom way. I don’t want to bash the comic so I will point out some positives. Ron Lim puts in some good art here and can make panels and splash pages with multiple characters look interesting. While the main comic itself is weak I did enjoy the tie-in comics mentioned above. Marvel Comics Presents had an interesting Thanos solo story where he somehow ends up in Death’s palace while working on his throne. Death appears to Thanos and gives him the option to have her back if he betrays and kills Adam Warlock. Then we get to see how Thanos thinks; he wonders if that was real, if he can do it, what will happen to the universe if he does do it, etc. all in a short period as he finally makes his decision. Warlock and the Infinity Watch actually advances the story of the characters while also having the most interesting plot points from Infinity War happening here. Gamora goes into Eternity himself and has a visually interesting experience as she recalls her own childhood with Thanos. There is also Thanos’s battle with his own doppelganger which actually had a cool moment from the Magus. So while the tie-ins had some good material and there’s strong art across the board the main story just isn’t good and brings down this comic. At the end of the Infinity Gauntlet event Adam Warlock had gained possession of the Gauntlet. Warlock now has the ultimate power Thanos had and like the Titan, the power goes to his head. After a short battle with Doctor Strange, Warlock is put on trial by Eternity, the living embodiment of the universe itself. After a short history of Warlock the Living Tribunal decides that he is guilty and must give up the gauntlet. Warlock is given the choice about who gets the Infinity Gems though and gives them to a few trusted individuals; Pip, Gamora, Moondragon, Drax, and a secret member, forming the Infinity Watch. 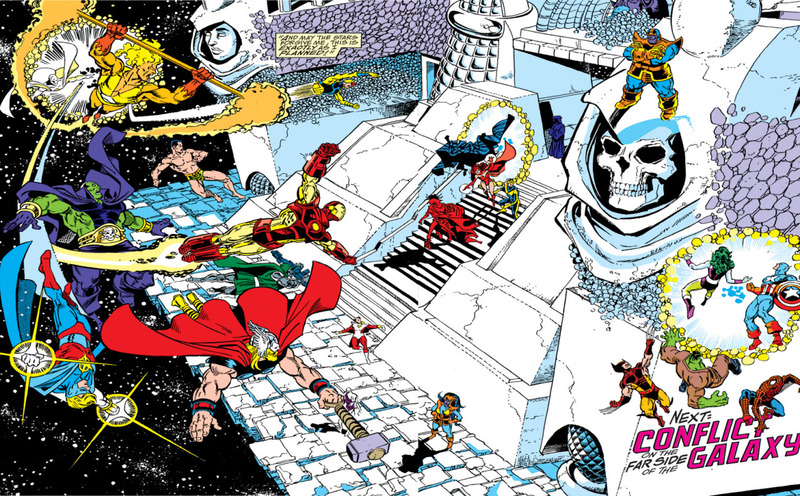 The Infinity Gauntlet Aftermath trade paperback contains Warlock and the Infinity Watch #1-6, Doctor Strange: Sorcerer Supreme #36, and Silver Surfer #60-66. The Doctor Strange story is just one issue where Stephen fights against Warlock because he was trying to remove the free will of the “evil.” Warlock sees his error but then Eternity arrives and tells Strange about the upcoming trial. This issue isn’t that important as Warlock and the Infinity Watch #1 gives enough reasoning for the trial but it’s a fun enough comic. We move into the Infinity Watch comic which is the most important series of the comics included. We start with the trial, which is mostly here to retell the backstory of Warlock to provide more context for the main plot of this arc, as we see his time on Counter-Earth which will be more relevant in the later issues. One thing I liked about this comic is that the Infinity Watch sets itself up like a regular team book but then they immediately split up. It’s a smart subversion for the beginning of the comic and it makes sense that these characters would want to be apart to protect their gems. The choices for the Watch are interesting because they’re not the most heroic group and that builds some suspense as you never really know what they’re going to do next. Another thing I enjoyed about these issues is the surprising level of comedy that actually worked for me. There’s the obvious jokes about Drax because he’s mentally deficient but when the High Evolutionary is just rambling to himself because of madness I just thought it was some funny stuff. We get to the Silver Surfer stuff after that but it’s really not relevant to the Infinity Gauntlet story and can be ignored as well. 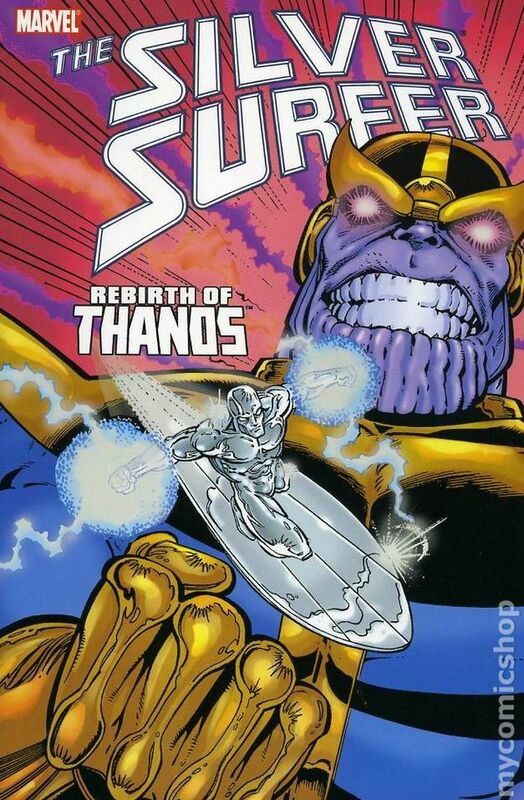 It’s weird because it’s six issues and there’s only about 2 pages in the last issue that I can remember actually relating to the Infinity Gauntlet and it’s not very important, just Surfer destroying Thanos’s temple to Death. These comics aren’t bad, it’s cool to see Mar-Vell again, but I don’t think it needed to be here in this collection. Now here’s the part this get’s tricky. As individual comics none of these are bad, in fact I’d say they’re all good. 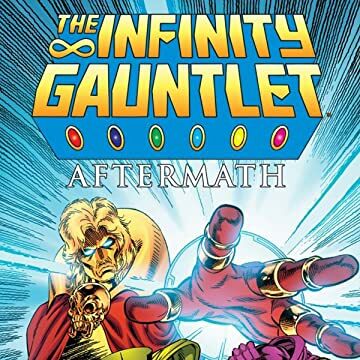 However, as a trade paperback called “Infinity Gauntlet Aftermath” half of the book has barely any relation to the event itself. So if you want to know what happens after Infinity Gauntlet I’d just read the six issues of Infinity Watch. Overall I’d rate the comics around the Full Price range each, but I wouldn’t recommend it collected like this. Here it is, the big one. Infinity Gauntlet is the most famous Thanos story and one of the most famous Marvel comics ever. 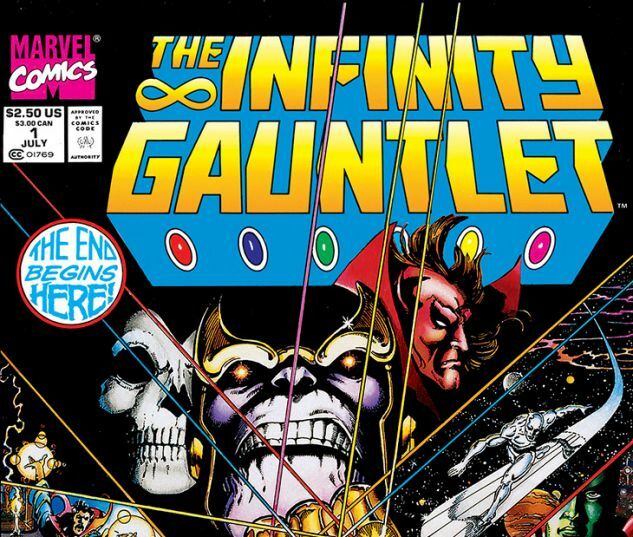 The Infinity Gauntlet is a six issue event comic that came out in 1991, almost a year after the Thanos Quest. With the six Infinity Gems in his possession now, Thanos has the ultimate power. Even this though, does not impress Mistress Death so Thanos goes through with his plan and wipes out half the universe with just a simple snap of his finger. Now all the remaining forces in the universe must band together to battle the Mad Titan. I first read the Infinity Gauntlet on it’s own, out of order with the rest of the list and I did enjoy it. After reading it again in the context of all these Thanos comics, I have to say that this is definitely the highlight out of all of them. This is the very first of the original Infinity trilogy and it starts the series out strong. It picks up right where Thanos Quest left off but with Thanos hanging out with Mephisto, the devil of the Marvel Universe. Here Thanos shows off the power he now possesses by using it to alter things to his liking, like removing his brother’s mouth and turning Nebula into a zombie-like creature. These first three issues really are just displays of power for Thanos as the heroes come together to face Thanos with help from a newly revived Adam Warlock. Issue four is where the heroes finally arrive for the famous battle where Earth’s mightiest heroes fight against Thanos and his girlfriend he created, Terraxia. Thanos dulls his own powers to give the heroes a slight percentage of victory and he still almost effortlessly wipes them out. The gems just give him too much power and he kills the heroes in creative and dark ways. I don’t want to spoil the rest of the comic now as I highly recommend it but from here the stakes have reached their highest and after this point everything just seems hopeless. I am a fan of what actually happens and while some might call this ending a cop out, it has to happen for the story to make sense. One of the best parts of this comic is again, Thanos himself. He’s all powerful and the comic really shows off the unlimited power he has now. The power goes to his head and he still doesn’t have full control of his omnipotence yet. This clouds his judgement and his love for Death makes him vulnerable to Mephisto’s tricks as he depowers himself and ultimately creates his own downfall. He ends this comic in a completely different place and it’s a good advancement for his character as he has become humbled. There’s just a really good balance between his more sympathetic traits and his outright evil actions. Infinity Gauntlet is an amazing read and is up there with some of the best comics in the genre. The Thanos Quest is a two issue limited-series that takes place shortly after the Rebirth of Thanos. Thanos now has his plan to destroy 50% of the sentient life in the universe and he knows how to do this but requires permission from Death herself. Thanos can never get a direct answer from Death, as he is below her, so she talks to him through a servant. This angers Thanos so he is now on the search for six powerful objects that combined will give him ultimate power so he can be equal with his love. Thanos Quest is a short series but it’s a really important one as it sets up the biggest Thanos event, the Infinity Gauntlet. It’s a unique comic as Thanos is the protagonist for the first time here. Even though he’s planning to kill off half the universe there’s an ulterior motive and that makes the story more interesting to me. His more personal reasoning for doing this does have me rooting for him and helps you forget about the ultimate evil goal. The motivation is way more interesting than just power for power’s sake or taking over the universe so you have a main character that’s fun to read about. 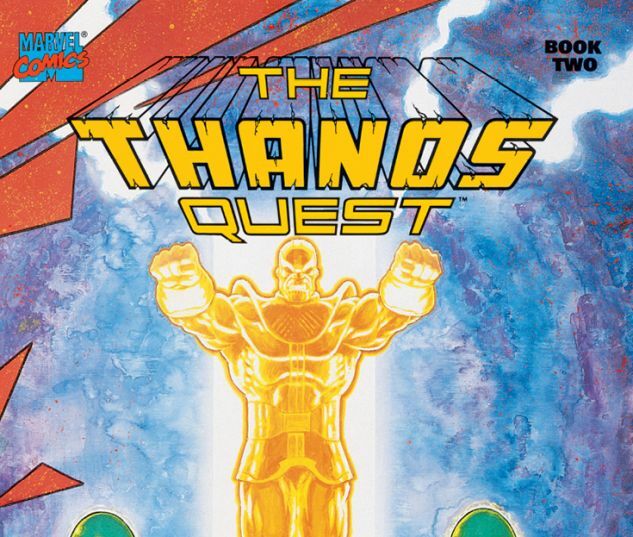 The quest itself is cool as Thanos faces off against multiple different cosmic entities while he finds the Infinity Gems, which are renamed here, as they used to be called Soul Gems. Thanos uses more than just brute strength against his opponents and it really shows his variety of skills. He uses bargaining, wits, and his power to tap into the other Infinity Gems as he collects all of them. Thanos’s power level grows with each stone he collects and the different ways he uses them are all interesting and show off the massive power in each one. This sets up the ending, which is a tragic moment for the character and leads perfectly into the Infinity Gauntlet. It’s a short two issue series so I’d recommend it anytime, even if you don’t plan on reading the next series it’s a fun little adventure across the Marvel Cosmic Universe. Hello everyone. Just a quick update I wanted to announce about the current marathon. Wanted to let you all know that 4 new books will be added to list to be reviewed soon. You can check out the new list on the original post, as it will be updated. Thank you and have a good day. It’s hard to keep Thanos down so the marathon continues with the comic, Rebirth of Thanos. The story begins with the Surfer landing on a deserted planet to take a break. He falls asleep but then notices a large skull castle. The Surfer tells himself he’s dreaming but when Thanos appears, called back to life by Mistress Death, Surfer must face this new foe. On his journey to handle this villain the Surfer deals with a returning villain and a revived Drax the Destroyer. This is a short five issue story so I won’t have much to say again but I did find this story enjoyable. It’s a pretty important story in the continuity as both Thanos and Drax return here after their deaths. Drax apparently died back in an Avengers comic when Moondragon blasted his mind. Now he’s been revived by Chronos but he’s mentally not all there now. He still maintains the drive to kill Thanos but now with the mental age of a child. It’s a funny change to the character and is how the character is for a long time. Not knowing much of the Surfer I did like his character. He’s interesting and the way he handles Drax and the Impossible Man shows his intelligence and more human traits. The most important thing here is that Thanos is back and even more evil. He has a new goal in mind, to wipe out 50% of the universe’s sentient life. Here Thanos is at his peak villainy. He laughs after wiping half of a planet out and making the Surfer make a tough choice to save the population. His attack on Nebula on what he does to her shipmate are just overkill. It’s neat to see how destructive and villainous he can be, especially after future stories in this marathon. Another aspect of Thanos, his Metron-like Space Throne, appears here for the first time and it adds more to his arsenal. My few criticisms of the comic would be the few things not explained like the last meeting with the Impossible Man and the death of Drax. The art doesn’t really stand out anywhere, it’s standard Ron Lim art of the time, except when depicting Thanos’s bombastic speeches. Overall I was a fan of this comic, despite those two hiccups, and recommend it as it’s important to the Thanos story. The marathon continues with one of the most famous deaths in comic history, Captain Marvel’s. Going into this I have to mention how before this comic I have read very little of Captain Marvel. Those eight issues collected in Avengers vs. Thanos are the most I have actually read of his solo comic. I am a fan of those issues I’ve read and would consider Mar-Vell one of my favorite Marvel heroes, (eventually I’ll make a list for that.) Another important thing to talk about is death in comic books. It’s widely known that death in comic books is cheap and that most characters that die will come back. It’s happened to almost all of the famous heroes. So one thing that sets this comic apart is that it still has not been undone. 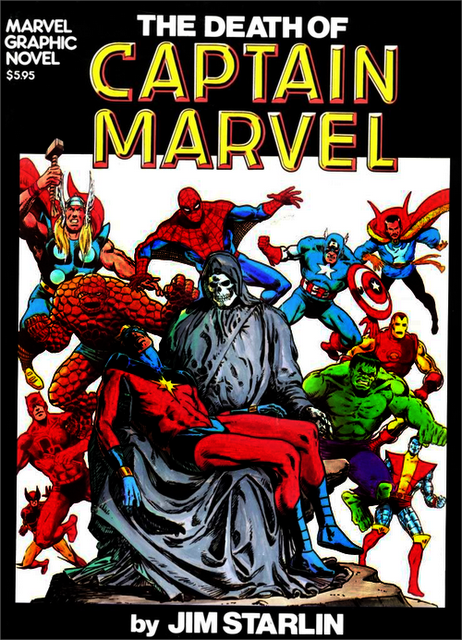 The Death of Captain Marvel is a short comic, only 64 pages, and the main plot of the story is told to you in the title so there won’t be much to talk about here. The story begins with Mar-Vell hanging out with Mentor and Eros, the father and brother of Thanos, on Titan, when he collapses. A scan is done on him and confirms something his cosmic awareness had told him long ago, that he is dying of Cancer. That’s the basic story and I don’t wanna spoil most of the events as this comic is about the journey towards the inevitable end. The thing that works the most about this comic is how realistic it portrays all of the events. The friends and loved ones of Mar-Vell just can’t believe it, especially Rick Jones and Spider-Man. Their scenes have the most impact as you wouldn’t expect something like that from them normally, but it makes for these two to be crushed by this the most. Rick was his best friend and the longest partnership he ever had while Spider-Man has dealt with multiple deaths of those important to him. Mar-Vell himself can barely accept the end of his life which is completely understandable. Of course because this comic is in this marathon that must mean Thanos appears. Thanos takes on an interesting role here as he guides Mar-Vell to death. He’s not in the comic for long but his relationship with death itself and his history with Mar-Vell gives a satisfying conclusion to the story and their characters. I highly recommend reading The Death of Captain Marvel. It’s a very good comic with great art and writing by Jim Starlin.